Who is organizing Science Hack Day SF 2018? Do I need to register to attend? Do I need to participate or can I just observe? Do I need to show up with specific ideas, materials, or people to work with? What hardware/tools will be supplied? What are some nearby local resources we can use during the weekend? Does Science Hack Day SF have a code of conduct? Can we come and go as we please throughout the weekend? Are there prizes? What are the categories for prizes? Do you provide teachers and classes for kids? Is there an age limit for attending Science Hack Day? The mission of Science Hack Day is to get excited and make things with science! People organically form multidisciplinary teams over the course of a weekend: particle physicists team up with designers, marketers join forces with rocket scientists, writers collaborate with molecular biologists, and developers partner with school kids. By collaborating on focused tasks during this short period, small groups of hackers are capable of producing remarkable results. • Who is organizing Science Hack Day SF 2018? The event is organized by volunteers: Ariel Waldman, Dawn Ho, Jun Axup, and Matt Biddulph. • Do I need to register to attend? Do I need to participate or can I just observe? Yes. You must be registered under your own name to attend the event – we do not allow drop-ins, we do not allow holding multiple tickets under your name, and tickets are non-transferrable. Please only sign up as an Attendee if you intend to hack at Science Hack Day for BOTH days. You are expected to participate – no observers. • Do I need to show up with specific ideas, materials, or people to work with? Nope! You can just show up and figure it all out when you get here. That said, we encourage you to do rough brainstorming ahead of time if you’re able to, and we encourage you to buy/acquire any materials, electronics, tools, crafts, etc. you think you may want to play around with ahead of time. We do recommend that you bring your laptop, if you have one. Essentially, if you have no idea what you want to do ahead of time, don’t worry! And if you do know what you want to do, be prepared that your plan might change when you get here. • What hardware/tools will be supplied? Check out the hardware wiki to see what will already be at the event. Science Hack Day is mostly a bring-your-own-tools/materials event, so if there’s something you know you’ll need ahead of time, bring it with you. Otherwise, you can always run to a hardware/craft store during the event. • What are some nearby local resources we can use during the weekend? If you need some quiet time, South Park is a 5 minute walk away at 64 South Park Street or there’s Mission Bay Public Library which is a 5 minute drive away. For hardware, go to Cole Hardware located at 70 4th Street, or if you need more selection try Discount Builders at 1695 Mission Street. For electronics, check out Central Computers at 837 Howard Street. For art and craft supplies, go to Blick Art Materials at 149 New Montgomery Street. • Does Science Hack Day SF have a code of conduct? Yes! Science Hack Day SF is an inclusive event based on treating all individuals respectfully, regardless of gender, sexual orientation, age, disability, ethnicity, national origin, race, religion (or lack thereof), body size or software preferences. So please don’t be nasty or mean. Be nice. Be considerate. Be civil. It’s easy. If you are being harassed, notice that someone else is being harassed, or have any other concerns, please contact a member of the Science Hack Day SF organizing team. 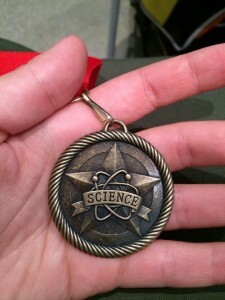 They will be clearly visible, wearing either a lab coat or T-shirt with the Science Hack Day logo. Or if you spot me, Ariel Waldman (I’ll be the one introducing the event on Saturday morning), please don’t hesitate to grab me. If you can’t immediately spot me or a Science Hack Day volunteer, please speak to a member of the venue staff/security and they’ll be able to get hold of me quickly. • What about intellectual property? All sponsors of Science Hack Day SF acknowledge and agree that they are merely providing sponsorship for Science Hack Day event and have no claim of right or interest in any copyrightable material, notes, records, drawings, designs, inventions, improvements, developments, discoveries, and trade secrets conceived, made, or discovered by Science Hack Day attendees, solely or in collaboration with others in conjunction with the event(s) sponsored. Furthermore, Ariel Waldman, Science Hack Day event organizers and Science Hack Day volunteers acknowledge and agree they have no claim of right or interest in any copyrightable material, notes, records, drawings, designs, inventions, improvements, developments, discoveries, and trade secrets conceived, made, or discovered by Science Hack Day attendees, solely or in collaboration with others in conjunction with the event. The venue is ADA compliant. We will be using a live captioning service for all talks and demos at the Main Stage that will be projected onto screens. If you have any specific accessibility needs or questions, please email [email protected]. • Can we come and go as we please throughout the weekend? Yes, until 9pm on Saturday night, when we lock the doors until 9am Sunday morning. Be sure to keep your lanyard with you so that you can get back in. • Are there prizes? What are the categories for prizes? Science Hack Day is a highly collaborative event where you can be part of a team or multiple teams if you choose. We do awards teams on the following categories, in addition to allowing the judges to make up their own categories as they see fit after watching the demos: People’s Choice, Best In Show, The Data Award, The Hardware Award, The Design Award. 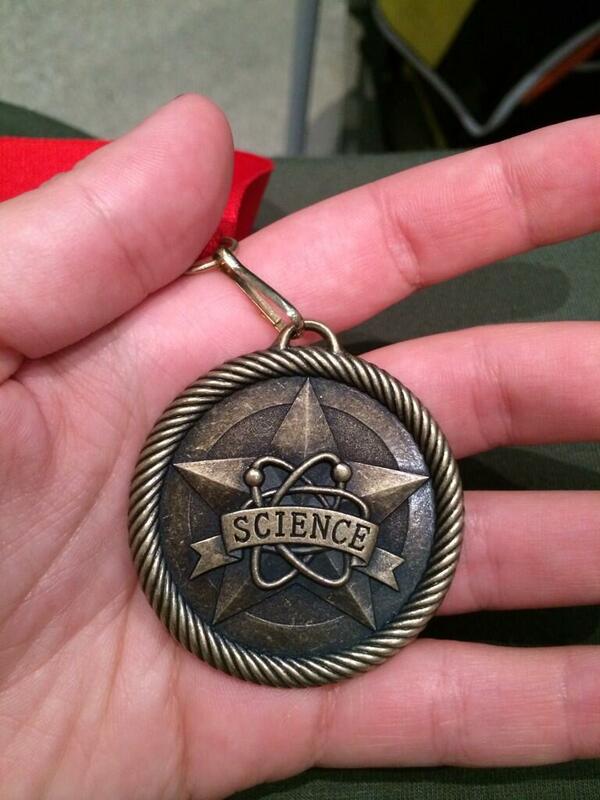 The prize is engraved SCIENCE medals! • Do you provide teachers and classes for kids? No. Science Hack Day is about exploring how to bring your ideas to life with a team of people, no matter your age. We don’t provide teachers, classes or tutorials – we want you to make things without instructions. If you’re a parent/guardian of a young child, we recommend you help them navigate finding a team and collaborating. • Is there an age limit for attending Science Hack Day? No, but we do have the following policies: Attendees under 13 years of age need to be accompanied by a parent/guardian. Attendees under the age of 18 are not permitted to attend the sleepover portion of the event that begins at 9pm on Saturday and concludes at 9am on Sunday. If you are attending with a baby/small child and need a quiet, private space temporarily, please ask one of the event organizers (we’re usually in white lab coats) and they can coordinate that for you.